I am sorry to say it. In spite of its great popularity and Academy Awards, Terminator 2 is a bad sequel. As you can see from my articles on the subject, I think highly of the original Terminator. Deep themes, awesome hero, exciting action: great movie. And, it seems like a sequel, while not necessary, could be a fine thing to have. Plenty of things are there to be explored: what is John Connor like and what does he do? How did Sarah make out? How did people survive the bombs? How did the war with the machines start? Any number of things. The ideal father, says an independent woman of the early 90's. Terminator 2 gives us replies to a few of these questions. For instance: “John Connor is a screwed up, whiny thief”, and “Sarah Connor became a militaristic sociopath, essentially selling her body for survival training and neglecting her son”. We might find both of these replies disappointing. We might say we would have preferred to see John Connor the inspiring military leader, rather than John Connor the emotionally scarred juvie candidate. We might say we had hoped Sarah would be happy somehow, or at least well-balanced and a good mother. We might even wonder how exactly we are expected to believe that John Connor the jerk kid is supposed to become John Connor the great military leader. But, these things are not the central problem with this sequel. All of these problems have to do with the facts of the story. The central problem with this sequel is not factual, but symbolic, and, sadly, it may have happened simply because they wanted Arnold to star in it and be the good guy; they made the hero a machine. As I said in the first part of my article about The Terminator, that movie is like a single metaphor: technological progress (a robot from the future) threatens to destroy humanity at its roots (an unborn child). But this movie says that humanity is worse than the machines at dealing with itself. 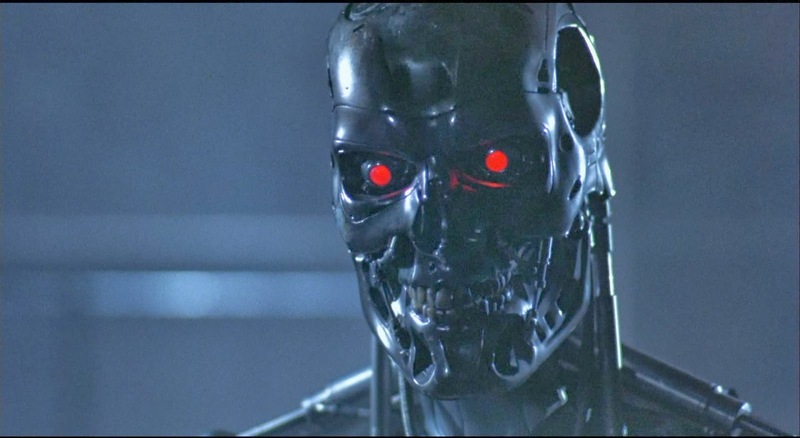 Why, in the light of this speech, should Skynet be stopped? Sarah Connor certainly wouldn't make a good witness for the defense. Now, let me attempt to clarify something: the events and characters of this movie are not somehow implausible, nor is anything factual in the first movie negated in its effect by this sequel. In fact, the result of Sarah and Kyle’s relationship depicted in this film is depressing in its plausibility. It is not somehow outlandish that a woman in Sarah’s position would turn out like she did, or have the opinion of men she has (given the sample she selected for herself after Kyle). She is a (sort of) widow with a baby son. She has the knowledge that the whole world is going to blow up and be taken over by killer robots in her lifetime (which, of course, no one will believe). And, she lacks the maturity mentioned in part 2 of the discussion of the first movie. Given all this, the way John acts follows as well. The problem though, as I said, is symbolic. The problem is what the movie says by having such a character as Sarah say what she said while the machine is the actual “hero”. So, what is the movie saying then?